Artshack, a Clinton Hill-based studio offering art classes, expanded with a new Bed-Stuy location on Bedford Avenue this month. 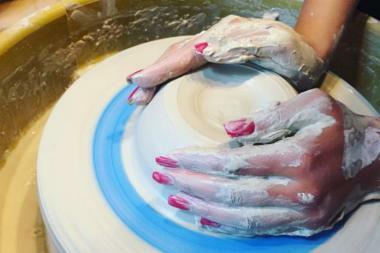 BEDFORD-STUYVESANT — Get your hands dirty at a new ceramics studio on Bedford Avenue. ArtShack Brooklyn, a studio on Waverly Avenue in Clinton Hill, expanded this month with a new spot specializing in ceramics at 1131 Bedford Ave. near Monroe Street. Visitors of all ages can learn about wheel throwing, hand building, design, slipcasting, plaster mold making and more, according to owners McKendree Key and Dany Rose. The 900-square-foot Bedford-Stuyvesant location opened on July 5 with space for about 15 people with eight potter’s wheels and three kilns. Young students can design everything from cups and bowls to sculptures and decorative pieces, Key added, and the non-profit raises funds for children’s scholarships by selling kids’ designs. Children are nominated for scholarships by teachers, community members and local organizers, according to the owners, and classes are offered with sliding-scale tuition. Classes are available for kids after school and throughout the summer and sessions for adults kick off on July 12 with guest artists. Those interested in access to the studio space can also become a member, Key said.